We often look for inspiring things “out there” someplace. An inspiring speaker or book, a Facebook video, a story of someone else’s accomplishment. But if inspiration is always found someplace else, then it’s always a struggle to go find it. That’s a problem. Here’s how to make inspiration ever-present and accessible, in what’s around us all the time. Prof. Eduard Franz Sekler, an old-world Austrian gentleman who is one of the patriarchs of the Harvard Graduate School of Design, had a rock. I took a seminar he taught when I studied architecture (a previous life). At the start of class Prof. Sekler would set his papers and notes on the table and put his rock on top of them. We could tell by the way he placed it each day that he was very fond of his rock. Though we didn’t pay much attention to it. One day Prof. Sekler asked us to consider how the design of things can influence the way we experience our lives. He picked up the rock and handed it around to us. We all held it, felt it, admired it. For the first time we really paid attention to it. He then took the rock and stood it up on the table. It had always lain flat on his papers, but it had a smooth end we hadn’t noticed that let it stand upright. 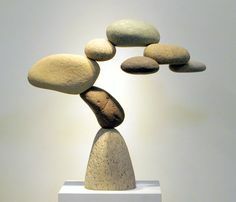 It shifted from mere rock to “object,” and we admired it afresh. He moved the rock to a tall stand that had been sitting in the corner of the room all semester with nothing on it. Given this place of honour, the rock was now the most interesting thing in the room. Finally, there were track lights on the ceiling that we didn’t generally turn on, but Prof. Sekler flicked the switch and the rock was spotlit against the wall, casting shadows and reflecting light from unexpected facets. It had become sculpture. We all burst out laughing with delight. The rock was so much more than we thought. We applauded the rock for its achievement, and we felt suddenly good about the world, optimistic and appreciative, eager to accept the rock’s invitation to see more in ordinary things. The way we experienced our lives in that moment suddenly changed for the better, which was the answer to Prof. Sekler’s question. We had been looking to the great architectural achievements of others for inspiration. But the inspiration we needed, to see things with a fresh eye, to appreciate detail, to take a creative risk, was sitting right there on Prof. Sekler’s papers all semester. This was one of Prof. Sekler’s great leadership skills, to show us how to stop looking elsewhere for what we think we lack, and to look to ourselves and the things we already have around us. A great teacher and a great leader are not far apart. As a leader, you can help your colleagues, your employees, your family, to draw on what they already have, which is always more than we think. To read more on the leadership power of ordinary things, click here. 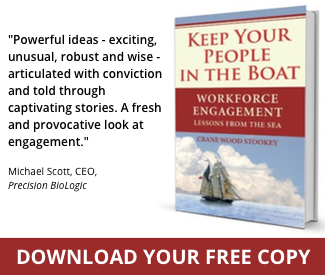 To read about a simple way to inspire a workforce, click here. Thanks, David. Great comment. It may be that actually, in the big picture, there’s nothing missing. We actually have what we need already, and we’re all already inspiring. Why not? Thank you for recounting the story of the transformation of Eduard’s rock. On our travels, we collected rocks of all kinds — – wave-polished pebbles, chips from granite curbstones, a spalled fragment from the choir of Notre-Dame de Paris, etc. They were with us as constant reminders that we are part of nature, but live for the most part amid surroundings shaped by previous generations. Perhaps your story will inspire some of your readers to put aside their electronic gadgets for at least an hour each day and start, again, to observe and question more intently what they see. One can learn a lot.